The Kettering Incident (2016. 412 mins over 8 Eps) is an Australian gothic drama created by Victoria Madden and Vincent Sheehan. With the advent of the new Twin Peaks, it’s interesting to see just how far its influence has been taken up by other shows. For the most part we follow the eternally confused Dr Anna Macy, played by Elizabeth Debicki, who shot to prominence playing Jed Marshall in the Night Manager (2016). Her return home is as much a surprise to the town's people as it is to her. Some view her as an unwelcomed reminder of a chapter of the town's history that everyone is trying to forget. For others she is almost a celebrity, as there is a tendency, in some quarters to believe that she killed her childhood friend. Like Twin Peaks, Kettering is a shaggy dog story. We meet the various town's people, some of whom talk about events which the audience are not party too. The show piles on mystery after mystery, offering few answers or even a traditional conclusion. As the audience, you are asked to experience the strangeness of the town without any real payoff. Do the lights in the woods denote this as science fiction, the enforced logging and the strange moss growing on some of the townsfolk adds an ecological angle and of course we have the mystery of what happened to Anna all those years ago which is brought right up to date when the girl who befriends her disappears into the woods leaving only a terrifying recording on her phone which sounds like she has been murdered. The three-disc set is presented with a widescreen anamorphic - 1.78:1 picture, with a choice of either a 2.0 or 5.1 audio track. The set contains no extras. Like Peaks, much of the story is presented as weird to engender an unsettling feeling in the audience and it works well. 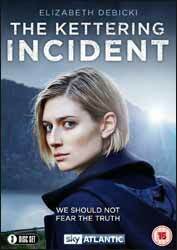 Elizabeth Debicki perfectly encapsulates the audiences own sense of being unsettled while trying to uncover the central mystery of what happened to her friend. Some may feel a little cheated as the show does leave a lot of mysteries hanging, although a season two might resolve this, I think it stands up well as a weird for weird's sake show.